The High Court (HC) on Tuesday granted bail for six months to Barrister Mainul Hosein, former Advisor to the Caretaker Government, in a case filed under Digital Security Act on October 26, 2018. The HC Bench of Justice Md Rezaul Haque and Justice Zafar Ahmed passed the order after hearing a bail petition filed by Barrister Mainul in the case. Senior Advocate A F Hassan Ariff appeared in the court on behalf of Barrister Mainul Hosein. Advocate Masud Rana assisted him during hearing. Deputy Attorney General Khurshidul Alam stood for the State. In the hearing, Advocate A F Hassan Ariff said, "Plaintiff of the case is not an aggrieved person here. And more cases were filed in different parts of the country in the same alleged offence. Barrister Mainul has already got bail in some other cases filed in connection with the same offence. So, he can also get bail in this case." 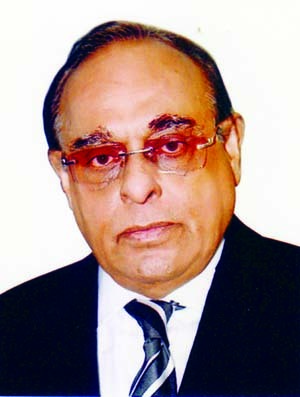 "In this case statement passed by Barrister Mainul Hosein specifically addressed to journalist Masuda Bhatti, which if it is taken to be a defamatory statement in that case, only Masuda Bhatti can file a defamatory case as per penal code and no other person can file a defamatory case for the said statement made by the accused addressing Masuda Bhatti," he added. After the court's order, Advocate Masud Rana said, Barrister Mainul got bail for six months in the case filed with Gulshan Police Station on October 26, 2018. "If the government does not make any obstacle, now there is no legal bar for Barrister Mainul to get release from jail," Masud Rana also said. The lawyer said, "Total 22 cases were filed against Barrister Mainul Hosein. Among those he got bail in six cases. There is no arrest warrant against him in rest 16 cases. So, he can get release and can file petitions for anticipatory bail." A team of Detective Branch (DB) of Police on October 22 arrested Barrister Mainul Hosein from Dhaka in a case filed in Rangpur Court. The same High Court Bench on December 5 granted bail for six months to Barrister Mainul HoseinÂ in two defamation cases filed in Rangpur and Jamalpur.